“I highly recommend staying with Anosha if you’re feeling the same call that I did. “I will start off this review with a self-call: I have been using AirBnB since it started and have been blessed by a life of privileged travel due to my own curiosity and the opportunities that have showed up along the way. “My most recent trip to Tepoztlán was my first time visiting. I went for the weekend to enjoy the lush environment, relax, and shop the weekend market. I chose Anosha’s guest house because I was so impressed by the food described in her website. Eating breakfast in her garden was one of the highlights of my trip. She served sweet grapefruit topped with seeds, berries and nuts, a glass of fresh squeezed orange juice, and tea made with herbs picked from her organic garden. This was followed by a bowl of muesli covered with fresh squeezed orange juice, seeds (packed with Omega-3 and protien), ground cashews,and finally topped with a variety of fruit. Passion Fruit was served on the side. In between courses I lounged in a shady hammock and enjoyed the sounds of nature that echoed through the canyon. I took in the view of towering mountains that dominate the horizon. The house was artfully decorated and I found fresh flowers next to my bed, in the kitchen and the living room. It was very clean and open, just like the pictures. 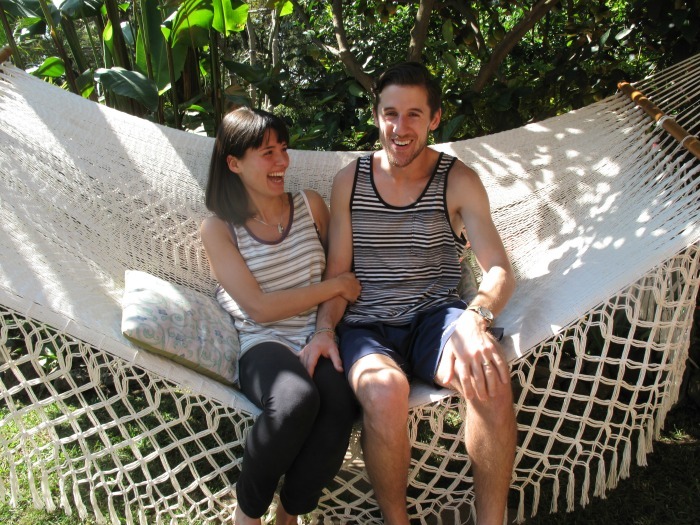 “I just came back from what was to have been a 5 day Detox and Yoga Retreat at Casa de la Vida. It turned out that I couldn’t bear to leave after 5 days and stayed an extra two on a Bed and Breakfast basis. During that time, Anosha took such good care of me, I accomplished all my goals and had a wonderful time doing it. She gave me delicious foods and juices and teas and I was never hungry. I learned to appreciate new foods like quinoa, chia seeds and delicious soups and salad dressings. There were the most gorgeous salads with exotic lettuces, brought from faraway places and grown in her own garden. I begged Anosha to write a cookbook! All of her food was so beautifully prepared and so delicious. Even though I have been doing exercises for years, I sometimes lose my motivation and Anosha re-inspired me with her methods, she is very skilled and knowledgeable so I easily placed myself in her hands. It was fun! Even more importantly, I have stayed inspired and have continued doing the exercises at home and have kept off the pounds that I Iost there. The hikes up the nearby mountain allowed wonderful views and the delicious feeling of being in a forest of trees with a little stream of fresh water. I have read all the other reviews here and can state that I agree with all those comments and they are all still true, so I will not repeat them. This is truly an extraordinary place. The only things that no one has mentioned before and that I loved were the beautiful white cotton sheets, ironed to perfection. I slept like a rock. After all this, I was then taken personally to shop in the stores with the things I was most interested in and shown the favorite restaurants in town. I am already planning my next trip back so that I stay inspired and also to enjoy once again the beautiful ambiance, relaxing pace, luscious gardens and the delicious food! “Anosha is a lovely and gracious hostess who immediately made me feel at home. She took time out of her day to show me around Tepoztlán- a quick walk or taxi to town. We went for a delicious and authentic meal right in the town square. The best surprise was when I realized she was a reiki master and a nutritionist. She fed me the most amazing fruits and juices and salads and had me buzzing from the fresh deliciousness she grows in her gardens. “We had a great time in this beautiful hidden spot. It’s unbelievable how peaceful and quiet… If u imagine that Mexico City is just “around the corner”. Outside of Tepoztlán on the bottom of a beautiful mountain chain located, this place is lovely, quite and pure relaxing. The center of Tepoztlán is easy to reach by a 5 min. Taxi Ride. The Guesthouse is super clean, all nice furnished and has a real good energetic vibe, that we have to say, is the result of the special and warm hospitality which Anosha the owner put in to this place. “We finally made it home after an eventful journey back. We were stranded in the airport in Houston for almost a day because of bad weather in Dallas, and were happy to make it home. That aside, we want to let you know that we had a fantastic time at your place, we learned a lot and relaxed a lot too. Anjali keeps talking about you and says that being in your house was the best part of the trip for her, she cherished the experience more than being with her best friend in Mexico City, and that is something. She definitely wants to visit you again, and so do we. Hopefully at some point next year we can come and visit you again, because it really feels as if we would be visiting a very good friend. We are working on our Kombucha, hopefully we are doing it right, but for now it seems that it is creating a lot of fruit flies, let’s just hope that it’ll work out. We will write a review for you in tripadvisor as soon as we can, and hopefully it will help you get more guests. “I felt absolutely happy in Anosha’s house!!! After one week of her treatment I got rid of THREE KILOS AND I LOST ALL MY TUMMY!!! Which seems like a “magic trick”, for with no diet had I achieved such an awesome result. This is because the healing effect of this cleanse is really powerfull. “If challenged to summarize in a single word, the Anosha/Casa de la Vida experience, I would have to say “impeccable”. The splendid setting is a reflection of Anosha’s attention to detail in her approach, her professionalism and her application. For more reviews, please visit Trip Advisor.